For over 20 years, Transformers have been mesmerizing children and collectors alike with their amazing transformations from vehicles and beasts to robots and back again. Each year brings new story lines, new products and new excitement while the characters’ personalities and transformations continue to evolve. 2005 continues this tradition of change and innovation. 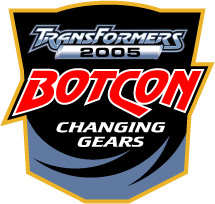 Join us this year at BotCon 2005 as we celebrate Transformers Changing Gears. The BotCon 2005 set will be a first in the history of Transformers’ Conventions, comprised of not one, not two, but seven figures in a deluxe boxed set. Each figure will be a redeco of a favorite Transformers figure ranging from the Beast Wars era to Energon. But that’s not all, not by a long shot; the set will feature three new head sculpts as well! This will be an amazing set for any Transformers fan to add to their collection. On the jungle world of Ceti Alpha Seven, the Decepticon General Deathsaurus, has rediscovered a technology once thought lost in the annals of time. Along with two of the remaining Insecticon clan members - the insidious Buzzclaw and the menacing Dirge - Deathsaurus has perfected the technology of self-replicating Transformers! With his army of Insecticon Clones, Deathsaurus will have the ability to overwhelm Autobot forces all over the galaxy. Cloning an army of self-replicating Transformers is a slow process and the Autobots, having been alerted to this diabolical plot, dispatched a squad to destroy the cloning facility before Deathsaurus completed his work. Ricochet and Chromia, led by Fallback, were charged with stopping Deathsaurus’ evil plan. Unfortunately for them, the Decepticons had set a trap and the Autobots were quickly overwhelmed! Now it is up to Ironhide and his cohort to rescue the squad and complete the mission…if they survive long enough! The city is famous for the largest private collection of contemporary outdoor sculpture in the country with works of art by James Surls, Frances Bagley and Isaac Smith. Frisco also fields three professional sports teams: the RoughRiders – professional baseball, FC Dallas – professional soccer and the Texas Tornado – professional hockey. The Dr. Pepper Baseball stadium and the hockey rink are one block from the hotel. Frisco is located north of Downtown Dallas and is a terrific location for exploring all of North Texas. The city is just 25 minutes from DFW International Airport and Love Field Airport. These are just a few of the reasons that make Frisco one of the fastest growing cities in Texas, and the whole United States! The Primus Package consists of: seven-figure boxed set (with Energon weapons) which includes Decepticons Deathsaurus, Buzzclaw, and Dirge along with Autobots Fallback, Ricochet, Chromia, and Ironhide, all packaged in their illustrated display box, a certificate of authenticity, tech specs, convention medal, convention name badge, convention program with comic, admittance to the sales room including a private sales room preview on Friday and Early Bird privileges on Saturday, admittance to the Awards Dinner, and admittance to all convention seminars. You will also receive $50 in gaming coupons for Casino night. This year’s figure set is outstanding! We have spared no expense on this set and we know you will love it. Cost for registration is $315 for non-members, or $265 for club members. You will receive your convention items upon check-in at the convention. The pre-convention tour is available for an additional charge. NOTE: Primus Package attendees will receive an extra convention piece not available with the non-attending package, however you must pick up your convention package in person. * This extra piece will not be sold and is our gift to you for making the trip. In addition, only Primus Package holders can be entered in the free trip give-aways on Sunday at 3 pm. Convention package confirmations will begin mailing in August. Dealer booths are $300 and consist of two 8’ tables and one 6’ table and are approximately 11’ wide by 8’ deep. Single tables are $160. Dealer booth contracts and payments postmarked by July 15, will receive a $25 discount (single tables are not discounted and are not available in multiples, only one per dealer). A Dealer Booth includes two badges, while single tables include one badge. Each Dealer Booth will receive one of the surprise gift items. Standard electrical hookups for all booths or tables are $125 per hook up (total for all three days). Telephone service can be provided at a cost of $120. Booths and tables are limited. Placement in the ballroom will be assigned in the order that the registrations are received. The earlier your registration is received, the closer to the front your booth will be. The entire facility is air-conditioned and carpeted. Dealer’s product content must be at least 85% Transformers related. This means robots, action figures or related products. General toys or dolls are not allowed. Dealers must have a valid Texas sales tax number and collect the 8.25% local sales tax. Dealers must register with the State Comptroller of Texas before the event. It can take up to 6 weeks to receive your Texas permit, so apply early. You can get a permit the same day at any local Comptroller Office. The forms are available from our web site transformersclub.com or from the State of Texas at window.state.tx.us. The Embassy Suites can handle your in-bound shipments, however please note that they will charge for items that need storage. Fees are $5 a day for small packages and $10 a day for oversize packages. If you need to ship incidental packages to the show, you can send them to: Jennifer Cline, Transformers’ Convention, (your name) arriving guest (date), Embassy Suites, 7600 John Q. Hammons Dr, Frisco, TX 75034. If you have large shipments, please call our office so that we can give you directions on how to send a timed shipment. Large shipments that arrive palletized on Thursday will not receive any handling charges as we will receive them for you and drop them in your booth space. A local shipping store will have a booth at the show to assist you in shipping your items home. They will have all types of packing materials and boxes available at the show as well. Prices will vary according to distance and weight. Our hotel is the NEW Embassy Suites in Frisco, Texas. This is a full service, all suites hotel with even a SPA on the property! The hotel has a wonderful pool and is adjacent to the Stonebriar Center Mall (the largest in North Texas). In addition they are within walking distance of over 200 restaurants. For those family and friends who will be attending with you, there are a lot of things to keep them entertained in the immediate area. RATE: Our special room rate of $129 per night is valid before and after the convention and includes the signature Embassy Suites services of complimentary cooked-to-order breakfast and complimentary happy hour in the evening. You can call 800-362-2779 or 972-712-7200 to make your reservation. Make sure you tell them you are coming to the BotCon Transformers Collectors’ Convention. You can also make your reservation online at Hilton.com (use the special code HAS). Airport shuttles are available from Super Shuttle 800-622-2089: $28 one-way or $50 round trip. You can get the special rate coupon by following the convention link at our web site transformersclub.com. Please note that there is some free parking (very limited) at the hotel and some paid parking in the covered garage. You can also park in the Stonebriar Center Mall lot for free. Over $1,000 worth of prizes will be awarded! There will be two different classes of Diorama (3-D art) Contests: Small Diorama (for custom figures) 24” x 24”: 1st $200, 2nd $100, and 3rd $50; Large Diorama 48” x 30”: 1st $300, 2nd $150, and 3rd $75. These contests will be awarded show dollars that you can spend with any dealer at the show. There will also be an Art Contest: 1st $100, 2nd $50, and 3rd $25. A three member jury will judge all Diorama and Art Contests. If your Small Diorama is larger than the space allotted, you will be moved up to the Large Diorama contest. Please stay within the dimensions for the contest you are entering. Oversized pieces will not be accepted. Each contest is limited to two entries per person and you must be present to enter. Please do not bring any entries that have won in past convention contests. Art Contest entries can be black & white or color. All Art Contest entries must not be larger than 20” x 24” and not smaller than 8” x 10” and must be mounted on foam board. All winners will be announced Saturday night at the Awards Dinner. Please let us know by September 1 if you intend to enter a contest so we can make sure we have enough space available. If you need a copy of the judging criteria, please send us a SASE or download them from the convention web site at transformersclub.com. All entries must be in place for judging by noon on Friday. Collecting and behind the scenes seminars will be presented on Friday, Saturday and Sunday. Each seminar will last approximately 45 minutes and seats approximately 500 people. Several different seminars will be presented each day on various collecting topics, including special voice actor readings, Hasbro Roundtable, Transformers Collectors’ Club Roundtable, and an IDW Roundtable. Special Guests and Seminars schedules will be posted at transformersclub.com as we receive confirmation. Registered guests will have a special Hasbro Roundtable presented on Friday morning. We have some surprises in store for you that will be announced later…. You can rest and relax with your friends in the Courtesy Room, which will always be open during the show. There will be refreshments available for all registered attendees. Make sure you check the message board for the list of rooms that will offer room-to-room trading. On Friday evening, we will be having the ever-popular Casino Night! There will be many different Casino games provided for your enjoyment. Each Primus attendee will receive $50 in gaming coupons while Protoform attendees will receive $25 in gaming coupons. Additional $100 coupons will be available for donations of $20. At the end of the evening, we will host an auction with many different types of prizes, everything from art to vintage figures using the gaming credits you have earned. You won’t want to miss the art that will be drawn on the spot just for the auction. Dealers who donate items will receive gaming coupons as well. Let’s all pitch in for charity and make a big donation. Our Awards Dinner will have a special program along with a sit down dinner. You never know what kind of surprises we will have for you at this special event. You should not miss it. In addition, we will present the contest winners with their trophies and show dollars at the conclusion of the dinner. General Admission for the Sales Room is available on Saturday: 9am Early Bird $50; Regular Admission 10 am-5 pm Adults $9, Children $5 (4 and under free); and Sunday 9:30 am-3 pm. You can park in the hotel garage for the $6 day rate or you can park in the Stonebriar Mall lot for free (1 block away). Hourly door prizes will be awarded at ten minutes to the hour each day while the sales room is open. Prizes will include all different types of Transformers and memorabilia. At 3 pm on Sunday, we will draw for two free trips to the 2006 Convention (including domestic airfare). You must be present in the Sales Room to win! We will start our week with a tour to Historic Fort Worth. If you sign up for the Thursday tour, you will pick up your registration materials on Wednesday night from 8:30 pm-9:30 pm. Sign-up today! Your whole family will enjoy this historic and informative outing. Our day will begin with a tour of the Historic Stockyards in Fort Worth. The history of the old west comes alive as you tour Mule Alley, the Cowtown Coliseum, the Livestock Exchange Building, Texas Cowboy Hall of Fame and the famous Cowtown Cattlepen maze and watch the Fort Worth Cattle Drive. During the tour you will hear stories of Indians like Quanah Parker and cowboys Bill Pickett and Jesse Chisholm. Learn about the colorful past of Fort Worth when the Chisholm Trail went right through the city and the Stockyards covered over a square mile! You will have a chance to try your hand at the Cowtown Cattlepen Maze that has over 5,400 square feet of frequently changed wooden pathways on two different levels. This is the same maze you saw the Amazing Race contestants navigate last fall. After lunch on your own, we will depart for the Bureau of Engraving and Printing Western Currency Facility. You will see billions of dollars during the tour of the Fort Worth location. The tour features the various stops of currency production, beginning with large, blank sheets of paper and ending with wallet-ready bills! Included in the tour are two floors of interactive exhibits and displays showcasing the history of paper currency and the intricacies of the currency production process. Samples are available (for a fee) in the gift shop. For the Saturday Awards Dinner, dress is smart casual (shirts with collars please). Please remember that the hotel facility is air-conditioned and can be cold inside. Texas can still be hot in September, so if you are going on the tour or will be doing a lot of walking outside, we recommend shorts. The Transformers Collectors’ Club Wants You! We have spent many long hours planning and researching this event. We have provided for all of your needs. This event is designed so that every member of your family will have a terrific time. With everything that is going on in the world today, you owe it to yourself and your family to take time out and attend this once-in-a-lifetime weekend of Transformers collecting. We want every member of the club to attend because this is your event! If you are interested in handing out flyers in your area, please contact us and we will be happy to send some to you.